In the summer of 1942, King Peter II of Yugoslavia came to the United States to seek military and humanitarian aid for his occupied country. He was very warmly received in Washington D.C. and was invited for dinner at the White House. President Roosevelt promised to give four B-24s to the exiled Yugoslav Government to help the resistance fighters in Yugoslavia. The Yugoslav Detachment of the 376th Bombardment Group stationed in Italy, was formed from a group of Royal Yugoslav Air Force personnel in exile. After the capitulation of Yugoslavia in 1941 these men risked their lives and instead of surrendering to the Germans, decided to leave their occupied country, hoping to find another opportunity to fight Hitler’s forces. 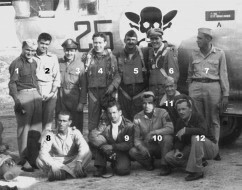 The pilots made their decisions based in part on the type of the aircraft they flew and their location when the call to surrender reached them. The aircraft they were trained to fly were British made Blenheims; Italian-made tri-motor bombers, (Savoia-Marchetti); and US-made Lockheed Model l0s, used in commercial aviation. The latter type were used to evacuate the King and the members of the Royal Government to Cairo, Egypt. Four other aircraft fully loaded (SavoiaMarchettis) managed to reach the Soviet Union. They landed separately at different points in Ukraine and near the Black Sea. Surprised by this escape the Russians brought the crews to Moscow where they spent four months waiting to be allowed to join the Yugoslavian military forces in exile. In August 1941, because of the intervention of the British Ambassador to the Soviet Union, Sir Stafford Cripps, this group of twenty-three men left the Soviet Union. It took seven long days to reach the Turkish border at Leninakan. By this time, there were about 300 Yugoslav Air Force personnel in exile living allover the Middle East. Most of the pilots began flying for the British Royal Air Force. In Egypt in September 1942, twenty six Royal Yugoslav officers and fourteen enlisted men were selected to go to the United States for training. They were active duty and reserve military pilots, navigators, communications personnel, and mechanics. This Group assembled in Miami Beach for English lessons in November, then went to gunnery school at Ft. Myers in December and in February of ’43 left Ft. Myers for various training schools. By June they assembled again at Salinas AAF Base in California and then on to Blythe AAF Base in August ’43 where they finished training and received their U.S. Air Force Wings. After an Allied conference in Quebec, the Pentagon decided that this special Detachment should return to the Middle East as a Yugoslavian unit operating with the American Air Forces. President Roosevelt kept his promise. At a ceremony held at Bolling Field, Washington D.C., on October 6, 1943, President Roosevelt presented four new B-24Js to the assembled Yugoslav flyers. The following day the four B-24s and their crews left the U.S. However, these aircraft and their crews were not destined to totally fulfill their mission outlined by President Roosevelt. The world political atmosphere in the fall of 1943 was greatly different from what it was in 1942: Yugoslavia was in a state of political and military upheaval. The Royal Yugoslav government in exile agreed that the four B-24s and their crews should join the Allied forces in Africa. On November 8, 1943, the Yugoslav flying personnel were attached to the 376th Bombardment Group, stationed in Enfidaville, Tunisia. After a week of training the Yugoslavs flew their first combat mission on November 15 to strike the Eleusis Airport, Athens. Then on November 24, in their first combat mission from San Pancrazio a Yugoslav crew was shot down by enemy fighters en route to bomb a target at Sofia, Bulgaria. The crew bailed out of the burning B-24, over the part of Yugoslavia occupied by Bulgaria. Within two days they were all caught, mostly by German soldiers and later turned over to Bulgarians. It took several weeks before they were taken to the POW camp at Schumen, Bulgaria, where they met the US survivors of the first raid on Ploesti. Bombardier-gunner Bogdan M. Madjarevic killed 24/5/44, while bombing a/c factory in Wiener Neustadt,Austria. He was only one killed aboard B-24. He is buried at Military cem. in Bari,Italy. It is desired to commend the Royal Yugoslavian Air Force detachment, attached to the 512th squadron of the 376th Bomb Group (Heavy) and the 15th AF for outstanding performance of duty in action in strategic support of allied forces in the Mediterranean theater. From November 1943 to August 1944- four (4) crews made up of forty (40) Officers and Enlisted men forming the Detachment flew regular and frequent combat missions attacking vital enemy installations; exhibiting the greatest bravery, stamina and skill completing eighty eight (88) successful missions. During this period the Detachment lost three (3) of their B-24 aircraft, and sacrificed three of their four crews, all lost over enemy targets. The Royal Yugoslavian Air Force Detachments by its actions has constantly given its utmost in devotion to duty for the allied cause, and will always be worthy of emulation. This is a book about the rescue of the crew and draw from other Liberator. The true story of an American Air Force copilot’s efforts to escape and evade the enemy after he is forced to jump from his plane above Yugoslavia and make it back to base in Italy.